If you need to move a hot tub in South Florida, call Cousins USA today. We have been moving hot tubs for the families of South Florida since 1996, and we have the skills and resources to get the job done on-time and on-budget. 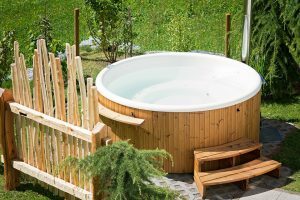 Our friendly customer service and thorough move planning will give you peace of mind, knowing that your hot tub will be handled with extreme care and will get to your new home in the same condition it left in. Trust the best moving company in South Florida to get your hot tub move completed quickly, safely, and affordably. Our highly-trained hot tub movers are knowledgeable in all aspects of safe hot tub relocation. Hot tubs can weigh, on average, 850 pounds or more, so moving one yourself can be dangerous if you’re not skilled in moving heavy objects. Our movers have years of experience moving hot tubs, and we will work closely with you and consider the best moving procedure for your hot tub to avoid any risk or damages while positioning it at your new home. We also offer affordable hot tub moving services, so you don’t have to worry about moving the hot tub yourself. With these moving plans, we gauge the hot tub’s dimensions and weight so that we can designate the appropriate number of movers to assist in its relocation. We also oversee water drainage and refilling, as well as safe power connection, to ensure that your hot tub is set for use upon arrival. If you need help moving your hot tub in and around Fort Lauderdale or South Florida, the movers at Cousins USA can give it the professional care and consideration it deserves. We are an agent of Stevens Worldwide Van Lines, a top rated national moving company. This means we can offer our customers all the amenities that a large, national moving company can provide during your hot tub move, while providing you with the personalized service you expect from a small business. We serve a variety of locations in South FL, including: Fort Lauderdale, Miami, West Palm, Miramar, Hollywood, and more! Here at Cousins USA, we provide local and long-distance hot tub moves, and so whether you’re moving to or from Fort Lauderdale or the South Florida area, we can assist with your hot tub move. No matter how large or heavy, we will use the most effective moving techniques to transport your tub safely so that you can relax. Additionally, we offer long- and short-term storage facilities. If for any reason you need your hot tub stored, you can store it in our climate-controlled storage facilities for an affordable price until it needs to be moved. But don’t take our word for it. Check out our many reviews from satisfied customers. Get your Fort Lauderdale hot tub move started with a free in-home quote by filling out our online form today.